"The Catholic Mary is a devil!" The Catholic Mary is a devil! "...if any man sin, we have an advocate with the Father, Jesus Christ the righteous." The Roman Catholic Mary is a usurper. Look again, this abominable image also says that Mary mediates/dispenses the grace of God. This is insanity when compared with the Bible. Why is light emitting from her wounds? Is she supposed to be the light of the world and power of God? Wait a minute, notice that she is pregnant. 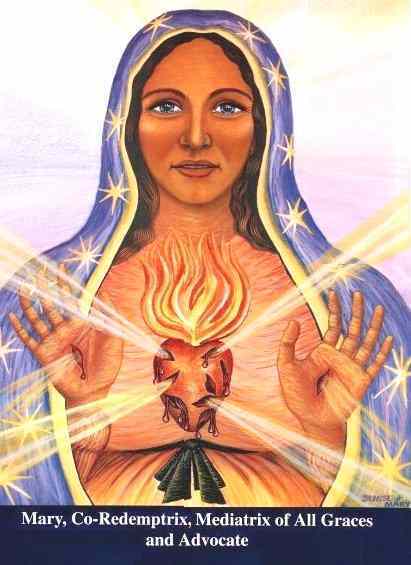 Jesus is supposedly still in her womb, a fetus totally dependent on her-- meanwhile she's all powerful! You may want to see our article "Catholics believe Jesus is a Mama's Boy". Did you know that Roman Catholics call Mary the "Queen of Heaven"? Did you know that the Bible talks about the queen of heaven? It does. The queen of heaven is A PAGAN GODDESS, A DEVIL-- Jeremiah 7:18 The children gather wood, and the fathers kindle the fire, and the women knead their dough, to make cakes to the QUEEN OF HEAVEN, and to pour out drink offerings unto other gods, that they may provoke me to anger. they call their Mary the queen of heaven. This is not the Mary of the Bible. The feast of the Queenship of Mary was established in 1954 by Pope Pius XII. The original date for this feast was chosen as May 31st, but was later moved to the octave day of the feast of the Assumption, August 22nd. This memorial celebrates the same event that is highlighted by the fifth glorious mystery or the Rosary. Throughout the New Testament, Mary's role in heaven is mentioned. Mary is alluded to as Queen in the book of Revelations [tracy's note: that passage refers to ISRAEL NOT MARY], and throughout the Bible. It is because of Jesus close relationship with his mother that she shares in his kingship. 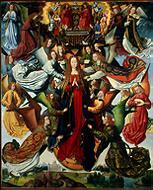 The Church and the faithful for have also referred to Mary as queen since the fourth century. Various songs, litanies, and prayers refer to Mary as queen. (e.g. Regina Caeli during Eastertide.) The Church has affirmed the title of Mary in modern times through documents including Lumen Gentium (..."and exalted by the Lord as Queen over all things, that she might be the more fully conformed to her Son" Lumen Gentium 59) and the papal encyclical Ad Coeli Reginam. 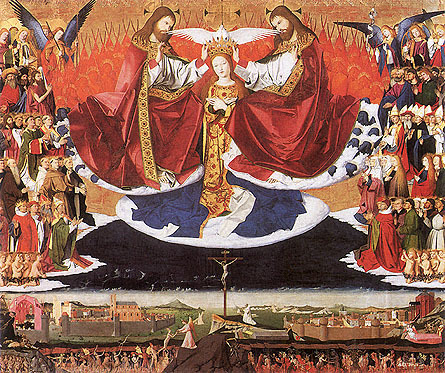 The title Queen is used to indicate the final state of the Virgin, seated beside her Son, the King of glory. There have been special interventions of Mary in local churches. She appeared at Fatima in Portugal in 1917 with a message of prayer and reparation for the salvation of souls. In addition to this Gospel message, the Virgin prophesied certain events in history which, some suggest, included the recent collapse of Communism. In Mexico in 1531, Our Lady of Guadalupe appeared to an Aztec peasant, Juan Diego, at which time she declared herself as "your merciful mother; to you and all inhabitants of the earth". As proof of her visit and concern, she left her image on the cloak, the tilma, of Juan Diego which is still displayed more than four hundred years later in the Basilica near Mexico City. More importantly, her appearance was the impetus to the evangelization of Mexico. Within a few years, eight million Indians were baptized. "Never hesitate to look to Mary, the Mother of the Holy Family." All-powerful and ever-living God, you raised the SINLESS Virgin Mary, mother of your Son, body and soul to the glory of heaven. May we see heaven as our final goal and come to share with HER glory. We ask this through our Lord Jesus Christ, your Son, who lives and reigns with you and the Holy Spirit, one God, for ever and ever. Amen. Hail, holy Queen, Mother of mercy, our life, our sweetness and our hope. To thee do we cry, poor banished children of Eve. To thee do we send up our sighs, mourning and weeping in this valley of tears. Turn then, most gracious advocate, thine eyes of mercy towards us. And after this our exile, show unto us the blessed Fruit of they womb, Jesus. O clement, O loving, O sweet Virgin Mary. It didn't take me long to find this information. It took me longer to format it than find it. You could spend a year looking up this goddess worship and still not be close to exploring it fully. Catholics pray to, worship, and venerate their Mary--this is not the Mary of the Bible. This is the queen of heaven spoken of in Jeremiah.